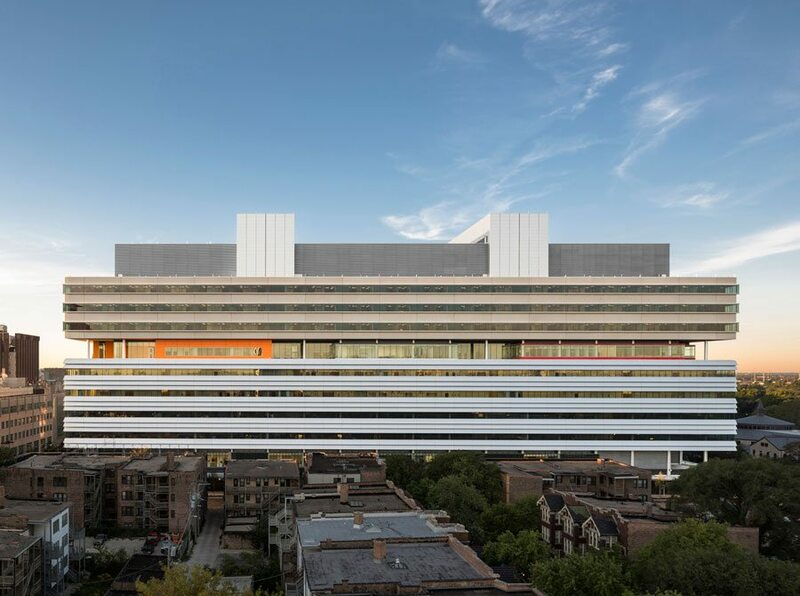 The building was designed to accommodate continually changing medical technology and practices; in particular, the 18-foot floor-to-floor height and large 31.5-by-31.5-foot structural square grid, allowing for extraordinary level of flexibility for re-configuring departments and upgrading equipment. The flexibility of the modular design also addresses the importance of evolving and delivery of high-tech care with advances in surgical, imaging and therapeutic technologies over time. At the heart of the hospital is the Sky Lobby on the seventh floor-housing central reception, and other public spaces – it effectively lifts the social, contemplative, outdoor space of a traditional campus quadrangle into the air. The Sky Lobby provides visitors with a unique waiting experience and expansive views of the university, Washington Park, Lake Michigan, and the downtown Chicago skyline.